WORLD WAR I, 1914-1918 - On November 11th, 1918 the guns that shattered world peace were silenced, and 'The War to End All Wars' drew to a close. 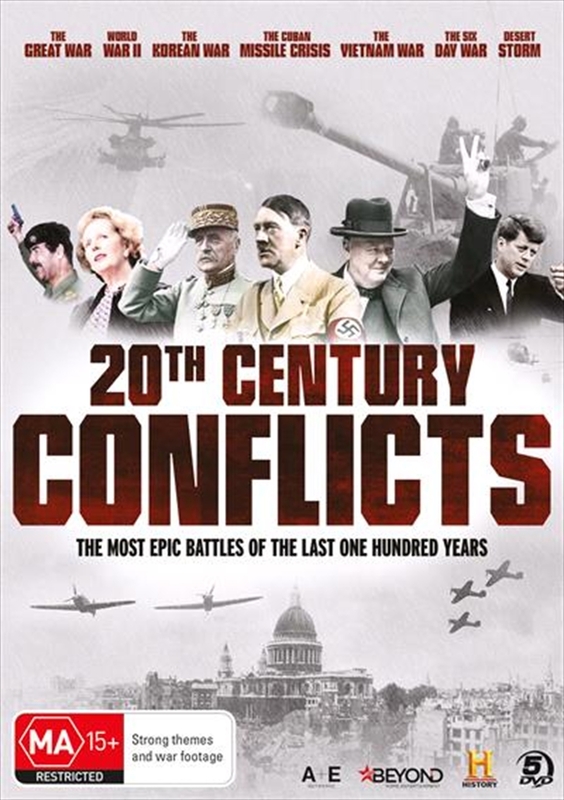 These programmes delve into the story of this epic conflict, which claimed the lives of over 20 million people. WORLD WAR II, 1939-1945 - An in-depth look at three of the most destructive and horrific battles of WWII. The 1943 Battle of Kursk engaged the German and Russian armies in a fierce conflict that raged for 50 days. The Omaha Beach landings during D-Day resulted in wholesale slaughter as machine guns and mortar fire ripped apart the Allied troops. The Battle of the Bulge in December 1944 was one of Hitlers last major offensives and became one of the fiercest conflicts of WWII. THE KOREAN WAR, 1950-1953 - As North Korea's army poured across the 38th parallel the war against international communism had begun. The first conflict to fall under the newly formed United Nations watch, the Korean war was the first military action of the Cold War. By its end in 1953, 5 million soldier and civilian lives were lost with the division between its two territories as significant as ever. THE BAY OF PIGS, 1961 - In April 1961, 1,300 Cuban exiles, backed by the Kennedy administration, landed in Cuba. Their mission was to overthrow the government of Fidel Castro. The assault was a disaster and the subsequent Cuban Missile Crisis brought the world to the brink of nuclear war. VIETNAM, 1954-1975 - VIETNAM IN HD, an epic six-hour miniseries, captures the sights, the sounds and the stories of the Vietnam War through intimate and revealing interviews with 13 people who experienced the war first-hand. Rarely seen footage, detailing crucial turning points in the Vietnam War, is combined with powerful storytelling to create an immersive experience. The perspective separates, as never before, the war from the warriors. THE SIX DAY WAR, 1967 - In 1967, Egyptian President Nasser rallied the Arab world behind a single goal: the destruction of Israel. Arab forces gathered on all three sides of the tiny country, but Israeli leader Dayan attacked first, decimating Egypt's air force and forcing the panicked Egyptian forces back to the Suez. DESERT STORM, 1991 - In February 1991, 700,000 Coalition troops surged forward to attack more than half a million Iraqi soldiers deeply entrenched in Kuwait. Despite a quick and decisive outcome against Saddam Hussein's army, success was by no means a certainty when the fighting began. This programme presents the United States as a gambler with an untried system, who went into a winner-take-all game against Saddam Hussein's army.